SnowSphere is pleased to announce the release of the new Russian Bear design, that is available now from the SnowSphere Shop. Following on from the SnowSphere snowboard Japan t-shirts and hoodies - we've done some soviet styling, using the bear, a symbol of Russia, combined with Cyrillic lettering to produce this brand new tee. The text reads "SNOWSPHERE" in faux Cyrillic, and "RUSSIA" in true Russian Cyrillic. Russia is a country with massive snow potential, which is highlighted by the fact that they will be the hosts of the 2014 Winter Olympics. 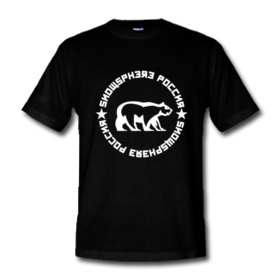 This shirt is ideal for lovers of: bears, Russia, SnowSphere or just sleek design. To see the colour ways and buy a shirt, visit the SnowSphere Shop. All SnowSphere designs are completely exclusive to SnowSphere.